Esprit Marina del Rey is just one of the many breathtaking oceanfront properties available at TodayMarinadelRey.com. For more information including leasing rates for waterfront apartment rentals, please visit TodayMarinadelRey.com. MARINA DEL REY, CA--(Marketwire - Oct 24, 2011) - TodayMarinadelRey.com showcases luxury apartment communities with resort-caliber amenities that embrace the vast and vibrant Southern California lifestyle with breathtaking harbor views and sunny skies year-round. Tucked away along the Marina del Rey harbor and mere minutes from Santa Monica and Venice Beach, Today Marina del Rey properties offer oceanfront apartments for rent, as well as secure boat slips with dock access to bring you the full marina lifestyle. Esprit, the flagship of five spectacular properties found at TodayMarinadelRey.com, will delight residents on Oct. 29th with the "Pirates of the Caribbean" themed Halloween party, which will feature a DJ, tarot readers and a costume contest with unbeatable prizes. Additionally, every week, Esprit's Facebook Page features at least one new "Esprit perk" or contest to thank residents for their loyalty. 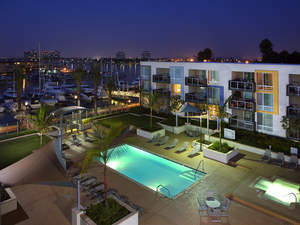 So whether residents are looking for some weekend fun, or looking to win big, this Marina del Rey property has it all. To enhance your lifestyle, TodayMarinadelRey.com property amenities also include salt-water swimming pools, kayak rentals, movie screening rooms, state-of-the-art gyms, fresh daily coffee and a friendly concierge staff to help residents make the most of their day, every day. The properties at TodayMarinadelRey.com focus on community involvement so residents feel that their family extends beyond their front doors. As such, Mariners Village apartments celebrated Halloween with a community party on Oct 21st and Marina Harbor apartments will host October Fest on Oct. 27th to extend the seasonal celebrations. Just beyond the apartment communities, residents explored their creative side on Oct. 23rd at the Bead Bazaar and can enjoy the Haunted House Event on Halloween day, Oct. 31st at the Burton Chace Park.